When I want to create really strong vibrant colour I will automatically reach for my DeocArt Media Fluid Acrylics every time. These small bottles are full of pigment and really pack a punch! One of my favourite techniques is to lay down some strong bright patches of colour, and then knock it back with a layer of Tinting Base which allows some of the original colour to show through. I love creating layers of colour in this way as a bit of history is created along the way rather than one flat layer of colour. Using Tinting Base with the Fluid Acrylics also adds opacity which makes for some great layers. Firstly add a layer of DecoArt Media Gesso to each card to seal it and create a ‘toothy’ base to paint on. While the gesso is wet it is optional to scribble into a little to add some texture. 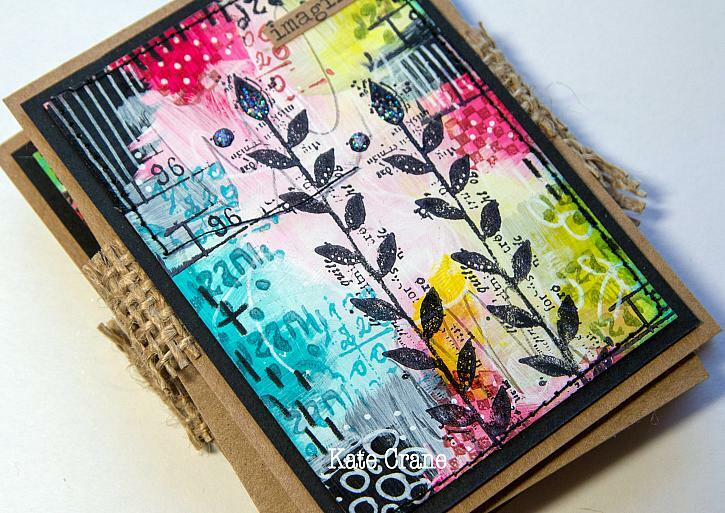 Add patches of colour with a flat paintbrush using the DecoArt Media Tinting Base and a little of the Primary Magenta. This will create light and darker areas of colour. Add further patches of colour using Cobalt Teal Hue and Green Gold along with the Tinting Base. It is helpful if you allow each colour to dry before adding the next to avoid making ‘mud.' Finally, add some patches of Carbon Black. I usually use a very dry brush and small amounts of paint; you can always add more! Once the layers of colour are completely dry, add a thin layer of Tinting Base working from the centre out, allowing some of the colour to remain around the edges. While this is wet scribble into it with a pencil to reveal some of the stronger colour underneath. Hansa Yellow Light is a lovely translucent colour which mostly goes with anything and really pops as a top layer! Tap on a little using your finger. I used coordinating inkpads as well as black to stamp tone-on-tone on the remaining patches of colour focussing on the edges but allowing the centre to remain clear. Use the white pen to add marks in the coloured areas. I tend to use simple marks such a polka dots, solid lines, broken lines and circles. Stamp the feature blooms onto the cards. I use a stamp platform for this as it really helps with accuracy. To add colour to the centre of the blooms I also stamped onto a scrap of painted card and cut out the petals which I then glued with DecoArt Media Matte Medium. These cards make a great little concertina book. Cut a piece of black card slightly larger than the original, and then another piece of Kraft card slightly larger again. If you want to add stitching, stitch through the original card and the black card, and then layer these over the cardstock trapping the hessian in between. To finish, add some touches of glitter glue and maybe a quote or two. Be sure to visit The Kathryn Wheel for more projects and to learn more about Kate Crane. Adorable. Great idea. Deco art is a great product tho I haven't used a lot. I go believe I will start using more. These are beautiful! Those doodles really make it for me. Thanks for all the photos of the process. I always love your colorful creations, Kate. Beautiful transformation! Love it! Will give it a go, maybe today! Love this creation, I think I'll give it a go. Thanks for the tutorial, Kate!